Its eyes can see 360 degrees without moving its head. It won’t miss prey—even those behind it. Choose up to 2 of your Benched Pokémon that have no Pokémon Tools attached to them. For each of those Pokémon, search your deck for a Pokémon Tool card, and attach it to that Pokémon. Shuffle your deck afterward. During your opponent’s next turn, any damage done to this Pokémon by attacks is increased by 40 (after applying Weakness and Resistance). Once during your turn (before your attack), you may discard a [R] Energy attached to this Pokémon. If you do, switch 1 of your opponent’s Benched Pokémon with his or her Active Pokémon. If your opponent’s Active Pokémon already has any damage counters on it, this attack does 80 more damage. Search your deck for up to 2 Pokémon, reveal them, and put them into your hand. Shuffle your deck afterward. Attach 3 Energy cards from your opponent’s discard pile to his or her Pokémon in any way you like. If your opponent’s Active Pokémon has a Pokémon Tool card attached to it, this attack does 60 more damage. Switch 1 of your opponent’s Benched Pokémon with your opponent’s Active Pokémon. The new Active Pokémon is now Confused. Discard as many [L] Energy attached to your Pokémon as you like. This attack does 30 damage times the number of Energy cards you discarded. When you play this Pokémon from your hand to evolve 1 of your Pokémon, you may put 3 damage counters on 1 of your opponent’s Pokémon. Put 3 damage counters on 1 of your opponent’s Pokémon. Your opponent’s Active Pokémon is now Poisoned. Switch this Pokémon with 1 of your Benched Pokémon. Choose 1 of your opponent’s Pokémon’s attacks and use it as this attack. If this Pokémon is your Active Pokémon, each Pokémon in play, in each player’s hand, and in each player’s discard pile has no Abilities (except for [P] Pokémon). It has a small heart and brain. Its stomach compromises most of its body, with enzymes to dissolve anything. If, before doing damage, your opponent’s Active Pokémon has fewer remaining HP than this Pokémon, this attack does 50 more damage. If this Pokémon is Knocked Out by damage from an opponent’s attack, flip a coin. If heads, the Attacking Pokémon is Knocked Out. Put 6 damage counters on your opponent’s Pokémon in any way you like. If this Pokémon has any [G] Energy attached to it, its maximum HP is 200. Discard a [F] Energy attached to this Pokémon and heal 50 damage from it. If this Pokémon has full HP, any damage done to this Pokémon by an opponent’s attack is reduced by 50 (after applying Weakness and Resistance). During your next turn, this Pokémon’s Overdrive Smash attack does 40 more damage (before applying Weakness and Resistance). If your opponent’s Active Pokémon is Asleep, this attack does 60 more damage. Your opponent can’t play any Pokémon from his or her hand to evolve the Defending Pokémon during your opponent’s next turn. During your opponent’s next turn, any damage done by attacks from the Defending Pokémon is reduced by 60 (before applying Weakness and Resistance). When you attach an Energy from your hand to this Pokémon, you may use this Ability. Your opponent’s Active Pokémon is now Asleep. Flip a coin for each Energy attached to this Pokémon. This attack does 60 damage times the number of heads. Discard a [M] Energy attached to this Pokémon. If the Defending Pokémon is a Pokémon-EX, it can’t attack during your opponent’s next turn. Discard 2 [M] Energy attached to this Pokémon. Prevent all damage done to this Pokémon by attacks from each of your opponent’s Pokémon that has any Special Energy attached to it. This attack does 20 more damage for each [M] Energy attached to this Pokémon. This attack does 20 damage times the number of [G] Pokémon and [Y] Pokémon you have in play. Once during your turn (before your attack), you may draw a card. If this Pokémon is your Active Pokémon, draw 1 more card. Once during your turn (before your attack), you may attach a [D] Energy card from your discard pile to your Active Pokémon. Each player can’t attach any Pokémon Tool cards from his or her hand to any of his or her Pokémon. While it sleeps, the head of its tail keeps watch. The tail doesn’t need to sleep. This attack does 30 more damage for each Energy attached to your opponent’s Active Pokémon. 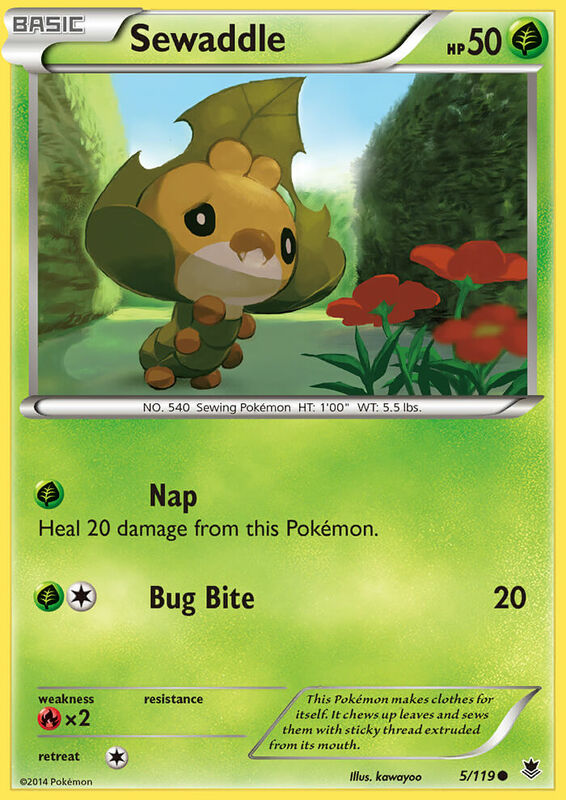 The attacks of the Pokémon this card is attached to cost [C] more.